Do you know what is happening on your business premises, at this moment? This is a challenge that many small business owners face – and where security monitoring can offer an ideal way to further strengthen your business security measures. Although CCTV cameras and intruder alarms can protect your business, what would happen if these systems were activated but were unmonitored? As they are, these types of devices can act as a deterrent, and security monitoring can offer an extra level of support. What is security monitoring? How do you go about setting it up in your start-up? Why might it benefit your business? Skip to the section that you want to find out more about, or read through the whole article for a more detailed overview of security monitoring. Alternatively, if you’re ready to compare quotes for business security straight away, simply complete the form at the top of the page. 1. What is security monitoring? When researching security monitoring, bear in mind that it can refer to two different types of business security: digital and physical. Digital security monitoring includes surveying digital activity, through a log, for example, as well as monitoring for threats or attempted breaches. It refers to the IT system and networks, and monitoring it may be a job of an in-house or outsourced IT manager. An alternative is to use cloud security monitoring tools. This page will focus on physical security monitoring, such as monitoring footage and activity from CCTV cameras and alarm systems. 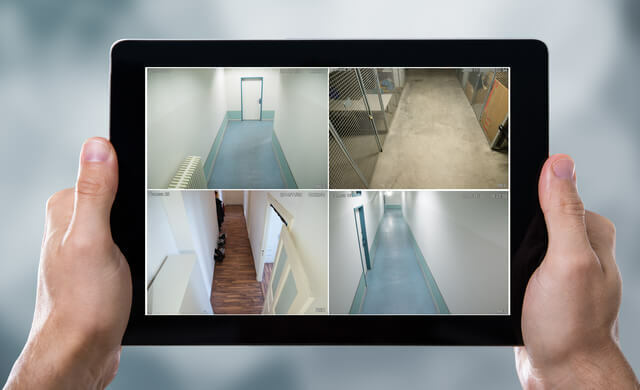 There are specialist companies that offer remote monitoring services, meaning they can manage security camera feeds or alarm systems anywhere, all from a central hub. Monitoring services can look for changes in activity, times and sounds (from your business’ usual routine) as well as notice suspicious behaviour and actual break-ins or security breaches. As well as monitoring, they can react if a break-in should occur, such as notifying you or the relevant authorities (like the police or other private security services). It may also be possible to use the same company that installed the devices. In this instance, you’d look for a monitoring package. These services are often charged on a monthly basis. Depending on your business requirements, you may want to find out if there are options for month to month, or other flexible or custom monitoring options, in addition to the standard ongoing monitoring services. Visit our alarm system costs page for more information on monitoring packages. While we’ve focused so far on using a professional company, it’s also possible to take a ‘do it yourself’ approach. This could involve using an app or software that connects the alarms or cameras to your device, allowing you to monitor activity. It allows you to access recordings from video cameras from wherever you are – you just need an internet connection and a compatible device (such as a smartphone or tablet). Such software may also be able to notify you via email or text message. It may be possible to use cloud security monitoring tools. This could be software that’s cloud-based or capable of uploading to the cloud, meaning that the video footage is stored remotely, for example. A strong, reliable internet connection is often essential for many aspects of business security, so if you’re considering internet-based security options, now is a good time to assess your business broadband. What are the benefits of security monitoring? One of the main benefits of security monitoring is that if a break-in should occur then responses can be within a very short amount of time. In comparison, if using a traditional bell-only alarm, it would take much longer before you or passersby are aware (and then it depends on someone notifying the authorities). Therefore, security monitoring offers an immediate reaction, should the worst occur and your premises’ security is compromised. Security fog also works in a similar way. As it deals with the after effects of a break-in, it can be helpful to use this in addition to deterrent measures. You’ll need to assess the level of security monitoring your business needs – complete monitoring of your premises or only some areas (such as outdoors or locations that are at higher risk or store more valuable items). Using a security monitoring service that you install and manage yourself (in addition to cameras or alarms that you have also fitted) gives you the flexibility to design a system for your business that’s easy to use and affordable. On the other hand, a professional monitoring company is just that – a professional service, dedicated to monitoring your business. Plus, if they have complete access this means you don’t have to worry about any security issues, allowing you to concentrate on other areas of your business operations. Professional security monitoring can assess your specific business needs. Which you’ll need depends on your business requirements. For example, a small site with one or two cameras or alarms, in comparison to a big site, with multiple alarms and cameras, are likely to have different needs. How many people are on your premises – both staff and visitors? What is the type and value of your stock? When is your business left unoccupied, and for how long? Security monitoring software allows you to monitor activity from potential intruders, as well as who is coming and going on your premises – this could be in addition to access control, for example. The software may have controls that allow you to change the size of the view of the camera, as well as search for specific dates and times. It may also be possible to select certain dates to playback footage, as well as use a timeline to move the recording to a selected time, giving you greater access to, and control of, the recordings. Often, you can view footage from multiple locations via the internet. Many software options are likely to be compatible with a range of different types of cameras. How many cameras can the software monitor? How does it play back footage? Is there an accompanying app available? How many sources can you watch the video from? Does it offer any additional features, such as motion detecting, activating a siren or scheduling monitoring? Is the software compatible with the cameras you have? Do you need security monitoring software that can work with analogue andHD cameras, or just one or the other? Check out our pages on the best business mobiles and laptops for small businesses. It’s possible to find software that’s available for free, although you’ll usually need the paid upgrade to benefit from all the features. Consider the cost of the ongoing use of security monitoring software, such as updates to keep the digital security up to date. In addition, think about the impact of renewing or replacing the software when new versions are available, as and when you scale up or down your security system. One of the key components of monitoring is the security camera monitor. There are several options when it comes to choosing screens, depending on how many cameras and feeds will need to be monitored at the same time. When thinking about this topic, you may think about the traditional image of a person monitoring multiple screen – an environment you would expect in a security company. However, it’s also possible for you to buy a security monitor screen and use it to monitor footage from your self-installed security cameras. Note that the monitors are usually multi-purpose, so you can also use it as a PC or TV screen if it’s no longer needed for security use. Is the security monitor screen compatible with the devices that you wish to use it with? Can it connect to your computer system? At this point, you’ve learned more about security monitoring, including what it is, how it works and why it could benefit your small business. For more specific information based on your business’ individual requirements, fill in the form at the top of the page to compare quotes for business security now.